We are a family owned and operated tree farm. At Laird’s Tree Farm we offer U-cut Christmas trees and have a variety of landscaping trees as well. We specialize in tree planting, tree removal or tree relocation, all year round. Laird’s Tree Farm also offers small load deliveries and skid steer rental. We offer tree planting, relocating and removal. 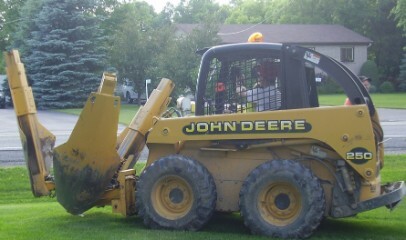 We also have skid steer rental with bucket, spade or forks. A great family outing as you choose your unique Christmas tree. Stay for complimentary hot chocolate, wagon rides and a bonfire.